Call it moonception, if you'd like. Astronomers say that a moon-with-a-moon scenario could explain some of the strange features of Iapetus, the third-largest of Saturn's 62-known moons. Iapetus was first discovered over three-hundred years ago by astronomer Giovanni Domenico Cassini, but it wasn't until 2004, during NASA's Cassini mission to Giovanni's namesake, that astronomers noticed a distinctive ridge, reminiscent of a walnut's seam, that runs almost perfectly along the moon's equator (the ridge is clearly visible in the image of Iapetus pictured up top). How the ridge formed is just one of the moon's many mysteries. The overall shape of the moon, for example, suggests that it once spun about its axis very quickly, making a complete rotation once every sixteen hours; but current measurements show the moon to have a much longer 79-day spin period. What gave rise to the moon's distinctive ridge and its puzzling shape — and whether the two are somehow related — has been the subject of some debate in recent years. Now, Kevin Walsh and his colleagues at Southwest Research Institute in Boulder, Colorado hypothesize that the two are, in fact, linked, and can actually be explained by the transient orbit of a sub-satellite (which we will refer to as a "moonlet"), generated by a large impact on Iapetus similar to the one believed to have formed Earth's Moon. In a paper recently posted on arXiv, Walsh and his colleagues explain that such an impact could have generated both a disk of debris around Iapetus and a moonlet, the former orbiting the planet at a smaller radius than the latter. 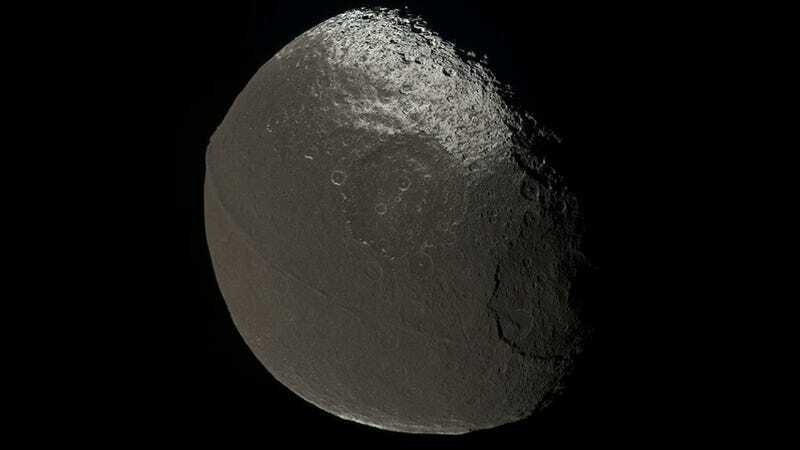 According to the researchers, the gravitational interactions between the moonlet and the debris disk would have pushed the debris back onto Iapetus' surface, forming the distinctive ridge we see today. At the same time, Saturn would have pulled Iapetus' moonlet further and further away from its surface, leading to the "de-spinning" of Iapetus itself. Eventually, say the researchers, the moonlet would have revolved far enough from Iapetus that Saturn would have stripped it away entirely.